On my second tour to Israel in 1968 my group stayed at the Guberman Hotel in Tiberias. My room mate and I set our alarm for Saturday, May 4, in time to go down the hill to get an unobstructed view of the Sea and the sunrise to the East. This slide was made on Agfachrome. 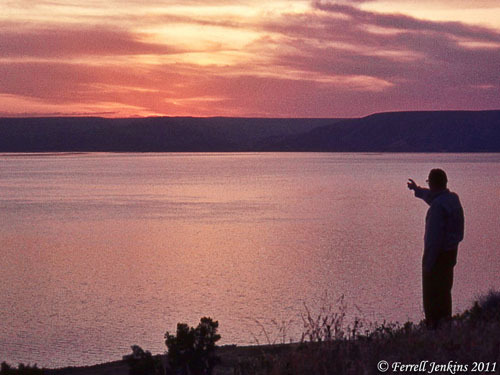 Sunrise at the Sea of Galilee - May 4, 1968. Over the years I have made numerous similar photos. I always think about Jesus meeting His disciples after the resurrection on the shore of the Sea of Galilee and eating breakfast with them. This entry was posted in Bible Lands, Bible Places, Bible Study, Israel, New Testament, Photography, Travel. Bookmark the permalink.